A NEW star has been well and truly born in the world of Grand Prix racing tonight after Pastor Maldonado powered to a wonderful victory at the Spanish Grand Prix. It is the first time a Venezuelan driver has won a Grand Prix and sees the iconic Williams team return to the winners circle for the first time since Juan Pablo Montoya’s win in the 2004 Brazilian Grand Prix. Second place for the home favourite Fernando Alonso sees him join world champion Sebastian Vettel level on 61 points at the top of the drivers championship. Great management of the delicate Pirelli tyres and some tactical strategy were the keys to Maldonado’s maiden success in just his 24th Grand Prix. He also had to stay calm under pressure from a charged up Alonso and constant backmarker incidents on his way to the top step of the podium. In the process, 2012 has become a record season. We now have had five different winners from five races, in five separate teams and the last time this happened was back in 1983. Also the top seven in the points standings are now covered by a meagre 20 points. Maldonado inherited pole position last night when Lewis Hamilton was sent to the back of the grid following McLaren’s costly error in not being able to give the FIA a litre of fuel for a sample after qualifying. However his lead disappeared when Alonso made the better start. 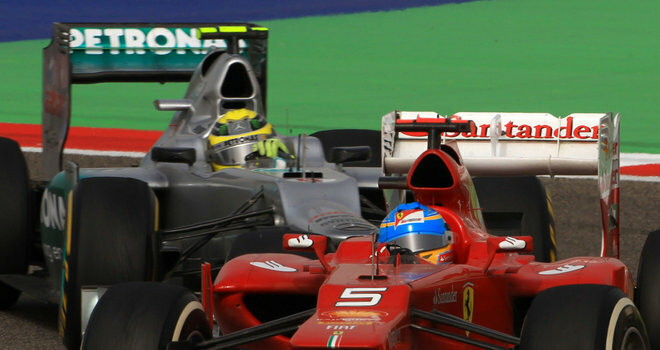 The pair went wheel-to-wheel on the rundown to turn one but just like in 2011, Alonso led into the first bend of his home Grand Prix. A clash between Romain Grosjean and Sergio Perez punctured a rear tyre on the Sauber and trashed the Mexican’s afternoon. 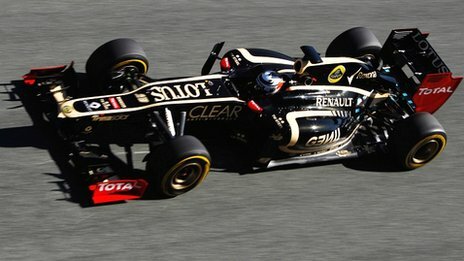 Kimi Raikkonen moved into a third position he would not relinquish, whilst Grosjean’s delay enabled Nico Rosberg to sweep into fourth place. Alonso kept a solid lead to make sure he wouldn’t be affected by DRS, although he never was able to leave Maldonado standing. Further back, there was trouble for Red Bull with both Mark Webber and Sebastian Vettel stuck in heavy traffic and both pitted inside seven laps to get some clear air. Later, the nosecones on the two cars were changed after some issues with tyre rubber and debris ending up in the front assembly of each chassis. A late fightback from Vettel, despite a drive-through penalty for ignoring yellow flags saw him back to sixth. 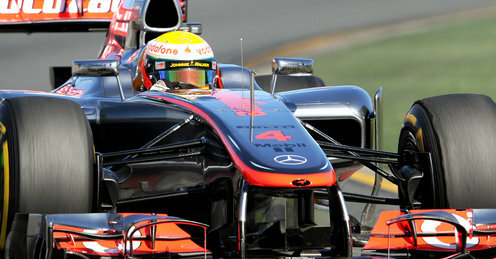 Webber missed out on points for the first time in 2012, finishing half a second outside the scorers in 11th place. Sharp pitwork from Ferrari kept Alonso ahead in the first round of pitstops and with Raikkonen and Lotus not able to show their prestigious long run pace from Friday’s simulations, the fight for the win turned into a two way scrap. 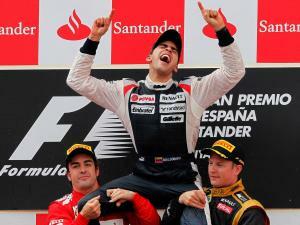 Out of contention though would be Maldonado’s team-mate, Bruno Senna. Senna was struggling behind Heikki Kovalainen’s Caterham in the early laps and was gambling on a two stop strategy, meaning he was mixing it with some of the frontrunners but on older rubber. On lap 12, Grosjean made a late dive up the inside into turn one and contact was made, removing a corner of the Lotus driver’s front endplate. One lap later, Michael Schumacher closed up quickly through the DRS zone but made a complete mess of his braking point. He misjudged Senna’s wherabouts and crashed into the rear of the Williams. Debris and tyre smoke flew into the sky as the two cars headed for the turn one gravel. Schumacher retired on the spot, his third DNF from five races and Senna had to park his car before getting back to the pits due to heavy rear wing damage. On the radio, Schumacher branded his rival an ‘idiot.’ The race stewards disagreed and handed a five place grid penalty to the German for the Monaco Grand Prix in two weeks time. After his qualifying exclusion, Hamilton had to start from the back and did well to miss a wayward Perez in turn three on the first lap. 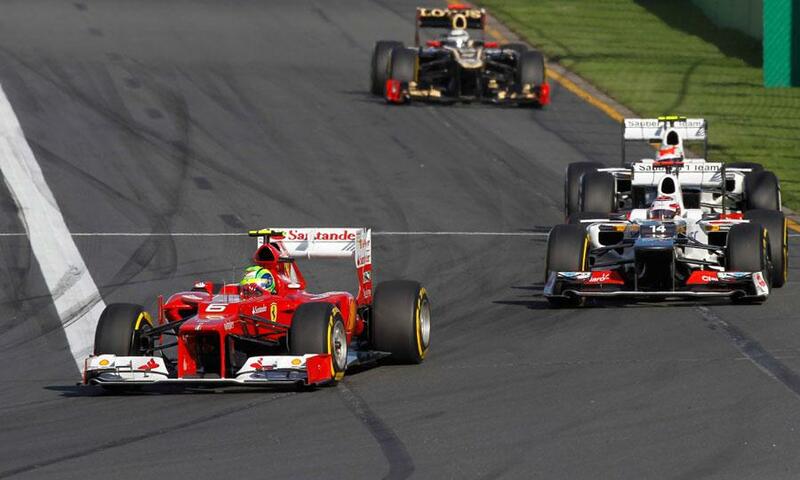 He battled well with tyre management and had an entertaining dice with his old rival Felipe Massa. 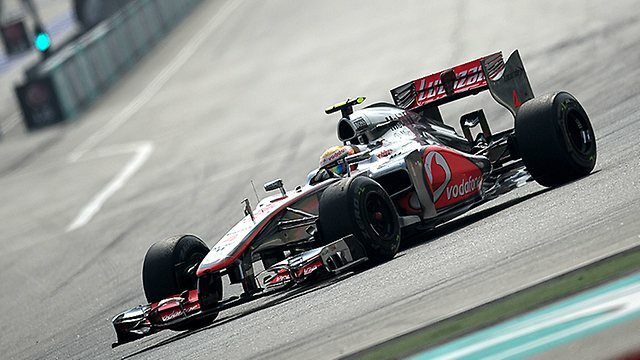 Hamilton eventually finished eighth whilst Jenson Button’s struggles continued and he could do no better than ninth. Tyre issues, understeer and a new brake supplier might well have accounted for his lack of speed throughout the last two days. Grosjean came through to finish an excellent fourth and Kamui Kobayashi matched his best ever result with fifth for Sauber. 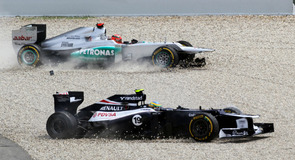 Nico Rosberg fell away to seventh place at the chequered flag as his tyres hit ‘the cliff,’ in the last two laps. Nico Hulkenberg took the final point after a solid drive in the Force India. Scotland’s Paul di Resta missed out this time in 14th and a drive-through penalty for ignoring yellow flags added insult to another disappointing performance from Massa, well back in 15th. After the race, celebrations were muted by a serious fire in the Williams garage. Luckily, there are no serious injuries although four mechanics had to be treated with smoke inhalation afterwards. (see separate story). A sour and fiery note to end on but take nothing away from Pastor Maldonado, who fully deserves his time in the limelight. It is always nice to see a new winner and who knows, we might get another one when the sport visits the jewel in the crown that is Monte Carlo in two weeks time. 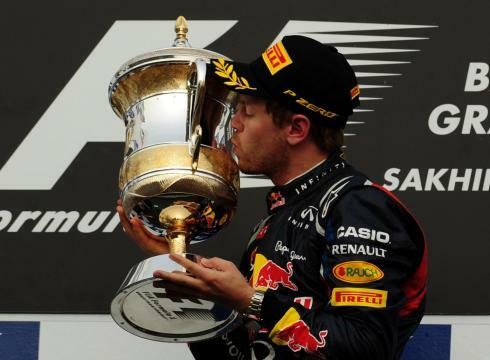 Anything is possible in 2012 if this season’s first five races are anything to go by. Talking Point: Will a new chassis save Massa from the sack? IT MIGHT only be the second round of the championship this weekend in Malaysia but already, Felipe Massa is under a pile of huge pressure to deliver. The Brazilian’s shambolic performance in last week’s season opener in Melbourne has left his future prospects of staying with Ferrari hanging even more by a thread. On Tuesday, the Italian team announced that a new chassis will be flown to Kuala Lumpur, but is that enough to save the charming Ferrari no.2 from the sack. From the moment Felipe spun off in the opening practice session, his fate in Albert Park of a mediocre performance was sealed. He never looked comfortable with the F2012, which it has to be said, is proving to be a real handful anyways. Qualifying saw him a distant 16th, four places behind Fernando Alonso. That was despite Alonso spinning out early on in Q2. Although he made an excellent start which saw him upto tenth, Massa quickly fell away from the leading group and spent the majority of the afternoon battling a poor chassis, high tyre wear and probably, his demons on a mental basis. He was overwhelmed by the likes of Kimi Raikkonen and Kamui Kobayashi and the race ended with an unsavoury tangle involving the Williams of Bruno Senna. When you consider Alonso saved fifth place for the team and was lapping 2-3 seconds a lap quicker on a regular basis, it highlights Massa’s nightmare Down Under. I described his driving performance as akin to a pig on rollerskates! It is a sad and sorry decline for one of F1’s nice guys. Team principal Stefano Domenicalli is still backing his driver though, telling JAonF1; “We need to stay close to Felipe because it’s clear that he’s under pressure. I’ve asked his engineers to analyse the data on the car, also to reassure him.” It means that there can be no excuses this weekend. I don’t think he has and Shanghai aside last season, I don’t think he has driven as well as he did that day at Hockenheim. Immediately afterwards, he said he would walkaway from F1 if he was a no.2, having experienced a similar order at Sauber in his debut season, ironically at the same circuit. Now I don’t know what Felipe Massa thinks about, but I wouldn’t be surprised if there’s a mental note saying ‘it is wrong to beat Alonso.’ It is frustrating, as he can match the best on his day. Since Hockenheim 2010, it has led to those basic errors that littered his first season in 2002 reappearing far too regularly. Don’t forget his attempt to pass cars on the grass on the approach to turn one of the 2010 Japanese Grand Prix? Of course, his high profile incidents with Lewis Hamilton last year have been well documented. Then, there’s the factor of the crash during qualifying for the 2009 Hungarian Grand Prix when Massa was knocked out by a loose spring that had bounced down the road off Rubens Barrichello’s Brawn GP car. He might have scars for the incident, but big knocks can affect a driver. Ralf Schumacher had a similar experience after a testing shunt in 2003 and he never recovered from this shunt, while it took Mika Hakkinen the best part of 18 months to fully recover from his near fatal accident at Adelaide in 1995. Only Massa will know how much the Budapest shunt has affected him. I do hope that the driver who came within seconds of the 2008 world championship does find some of his old form again. The bare facts are he hasn’t scored a podium since Korea 2010, the longest run a Maranello driver has gone without a podium since Eddie Irvine, 17 races between (1996-1997). We will see whether a new chassis is the solution to Massa’s problems. However, more races like Melbourne and Felipe will be lucky to see the season out, let alone hope for a contract extension. ON THE twisty, tight Valencia road circuit in Spain on Monday, the sound of a Formula One car roared out of the pits, as one of its most charismatic figures made his official return to the sport. 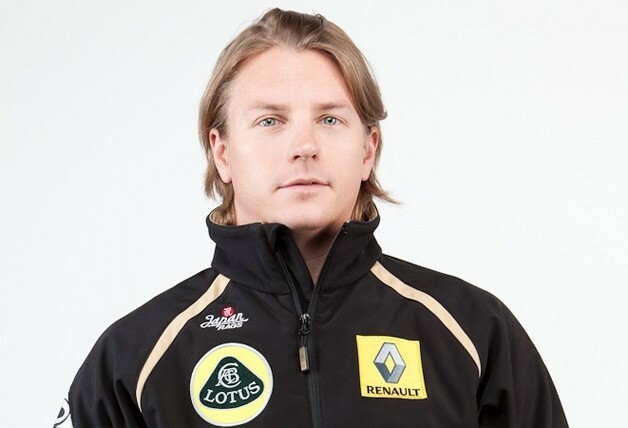 Known to enjoy a party or two and not the media intrusion from his past, Kimi Raikkonen is back! Michael Schumacher’s comeback in 2010 hasn’t proved to be a success and it will depend on how competitive Lotus are to see if Raikkonen’s newly-found motivation continues. No-one can question his natural speed, nor the excitement he has shown down the years (remember going through Eau Rouge flat through engine smoke in Spa qualifying 2002), the question will remain; will he be able to commit to a project that is more likely to achieve in the longer than shorter term. However, it is great to see Kimi Raikkonen back in the sport and I’m sure he will remind us of his talent that did take him to a world championship five years ago. 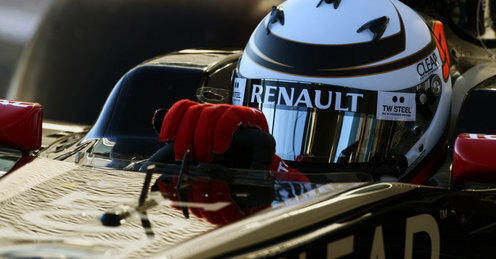 Six world champions on the grid is unique and the Raikkonen return will be one of the most compelling features within the 2012 dynamic.